If someone were to ask me what my favourite fairy tale was, I would answer "Beauty and the Beast" every single time. As such, whenever I saw Beauty on the shelves at whatever bookshop I happened upon, I found myself seriously tempted. It was quite some time before I finally caved and bought the damn thing, which is surprising considering how weak my willpower can be. After a couple of novels that were less than great, I was really hoping that I could rely on a retelling of my favourite fairy tale to get me back into a positive state of mind. Beauty grows up finding her nickname more of a burden than anything else. Adopted as a result of a precocious outburst after her father tried to explain the meaning of her birth name, Honour, when she was a small child, it is something of a cruel irony that she instead grows up to be plain at best, especially when compared to her stunning older sisters. She dreams of becoming a scholar while her sisters look to good marriages, but they find that their world is soon to change. A storm ruins their merchant father's fortunes, forcing them to leave for the country and a humble life in a farming village. While in the country, Beauty's father becomes lost in a storm and takes shelter within a mysterious castle with seemingly invisible servants. But after he unwittingly abuses the hospitality offered to him, he must make a deal with the castle's bestial owner: in one month he must return to the castle, where either he or one of his daughters must stay as prisoner. So, first thing's first, the story. If you've ever seen an adaptation of Beauty and the Beast, whether it be the Disney adaptation or one of the many modern retellings that seem to exist, then you have a pretty good idea of where the plot will be headed at any one time. There's not much in the way of surprises when it comes to Beauty, but honestly, were you really expecting any? If you aren't a fan of the original fairy tale, then Beauty probably won't change your mind. With that out of the way, on to the specifics. Beauty is narrated by the title character and while I admittedly had a seriously positive expectations of her before I started the novel, I found that they were more than met here. While I have always identified with her book-worm nature, ever since I was a little girl, I was rather intrigued by the way that her bookishness is conveyed here. Normally you'll get bookish characters turning to classic works of fiction purely for the pleasure of reading, and while I don't mind that at all, I was quite pleased to see Beauty view her reading in terms of academic study as much as she does it for the fun of it. It gives her a much more practical and sober tone of narration, which was a far cry from the more whimsical tone I had expected. Additionally, I like that she isn't a beautiful girl like she is in other adaptations. While she tries not to let it bother her, it is a real sore spot for her and it made her feel all the more relatable; I think most women go through at least one point where they look around and don't feel pretty enough, and that feeling is captured almost painfully well through her fights with the servants trying to dress her in pretty clothes. Oddly enough, I found that I liked the Beast less than I had initially thought I would. To put it simply, he didn't really seem all that bestial, which seems to be missing the point somewhat. When Beast was consistently polite and good-natured towards Beauty, I couldn't help but be disappointed. 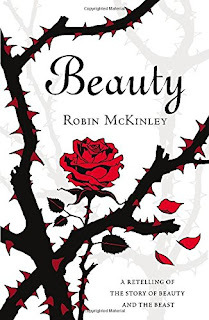 Because while the romance between him and Beauty does still develop at a nice gradual pace as she learns to look beyond his outer ugliness, it doesn't feel like there's as much character development for the Beast himself, it's all on Beauty's shoulders. Admittedly, it might be because he's quite a bit older than Beauty here, but I've always thought that Beast's sullen and bad-tempered nature is kind of necessary for the stakes to feel real. I've always seen his temper and mood swings as a kind of emotional defence: if she doesn't reciprocate because of his looks, then he can convince himself that he didn't care about her opinion in the first place, and if she's chased away by his personality he can attribute it to physical appearance. It's an issue for him to work through as a character arc. When Beast is always kind, it feels more like a waiting game, something that would happen at some point regardless. It by no means ruins Beauty, but I can't lie and say that I wasn't a little disappointed. Finally, I feel that I should return to the story, and mention the ending in particular. It's no secret that a lot of fans are disappointed by Beast turning back into a human. After developing so much affection for him as a Beast, the reaction to the spell being broken tends to be, to quote Greta Garbo, "Give me back my Beast!" Beauty is no exception, but I don't think anyone was expecting anything different here. I will mention that the ending seemed a bit brief for my tastes, but it still isn't a bad ending considering the constraints set by the original fairy tale.